Lets take a break from all the diet-friendly, light-and-healthy stuff for a minute and take a brief, delicious detour into comfort-food-land. I don’t know about the rest of you, but here in New York we’ve been buried under over a foot of snow since Christmas, with major winter storms battering the tri-state almost every week. They’re saying its the worst winter in at least 6 years, and that January 2011 was the snowiest month in New York’s history (or at least as long as they’ve been keeping track of such things). Its certainly the worst winter I can remember since I was a kid, and all this snow, ice, and frigid cold absolutely necessitates hot, hearty, and homey meals. Enter the meatloaf. This isn’t something we make often, but a recent feature in Fine Cooking’s February/March 2011 issue on this classic favorite inspired me. One of the great things about Fine Cooking is their build-your-own recipe model for favorite dishes like pasta bakes, risotto, and cheesecake – they provide instructions for a basic method, and then give you easy ways to customize the recipe to fit your tastes using swappable ingredients and optional mix-ins. This is cool in the magazine, but their online tools make the whole process even more fun and easy; just drag and drop the ingredients that appeal to you, and the tool automatically creates the recipe for you. Neat, right? The recipe that Fine Cooking’s tool generated for us is below (with a few inevitable changes) but I highly recommend that you try the recipe builder out for yourself. The possibilities are endless! 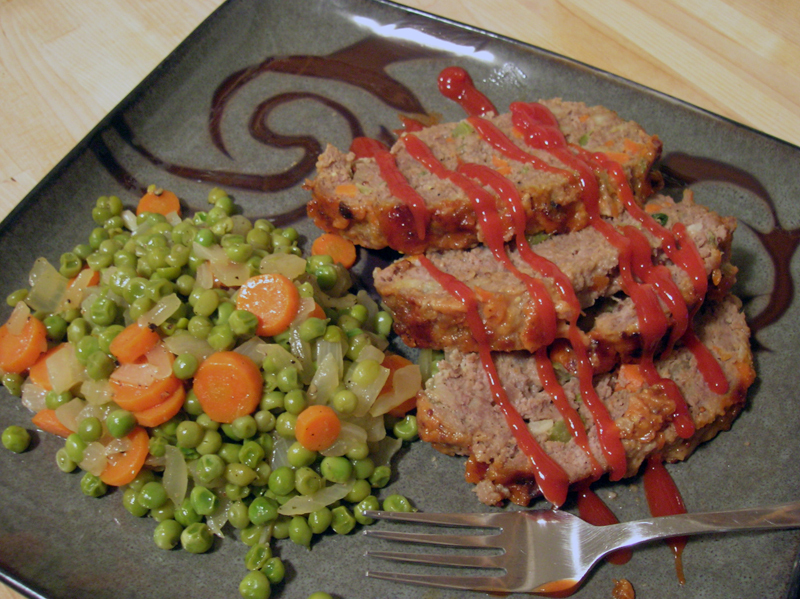 We paired the meatloaf with a somewhat retro side dish of peas and carrots, given a bit of an update by using fresh carrots and frozen peas instead of canned (blech), adding fresh onions, and sauteeing everything briefly in a bit of butter. Seasoned with salt and pepper, a touch of sugar, and a squeeze of lemon, the vegetables stay a little crunchy and plenty flavorful. A scoop of creamy mashed potatoes to round things out wouldn’t go amiss, either. I know there's not really any way to make ketchup look anything but gruesome. But, I really like ketchup on my meatloaf. Heat 2 Tbs. of the oil in a 10- to 12-inch skillet over medium-low heat. Cook the onion, carrots, celery, and garlic, stirring frequently, until softened and just beginning to brown, 6 to 8 minutes. Transfer to a large bowl and let cool until warm. In a shallow dish that holds it in a single layer, soak the bread in the milk, flipping once, until soggy but not falling apart, 5 to 10 minutes, depending on the coarseness and freshness of the bread. Lightly squeeze a handful of bread at a time to remove some of the milk (it should be wet but not drenched). Finely chop and add to the bowl with the onion mixture. Position a rack in the center of the oven and heat the oven to 375 degrees F.
Add the beef, pork, veal and eggs to the onion mixture. Scatter the poultry mix (or fresh herbs) and pimenton over the meat, and then sprinkle with the Worcestershire, 2-1/4 tsp. salt, and 1/2 tsp. pepper. Use your hands to gently mix all the ingredients until just combined; try not to compact the mixture as you do this. Heat the remaining 1 tsp. of oil in a small skillet over medium-low heat. Form 1 Tbs. of the meatloaf mixture into a small patty. When the oil is hot, cook the patty on both sides until cooked through, about 5 minutes total. Transfer to a plate and let cool slightly. Taste and adjust the salt, pepper, and other seasonings as needed. Repeat until you’re satisfied with the flavor. Mix the ketchup, mustard and shredded cheese together in a small bowl. Line a baking sheet with foil. Transfer the meatloaf mixture to the baking sheet and form into a 10×4-inch rectangular block (it becomes loaf-shaped as it cooks). 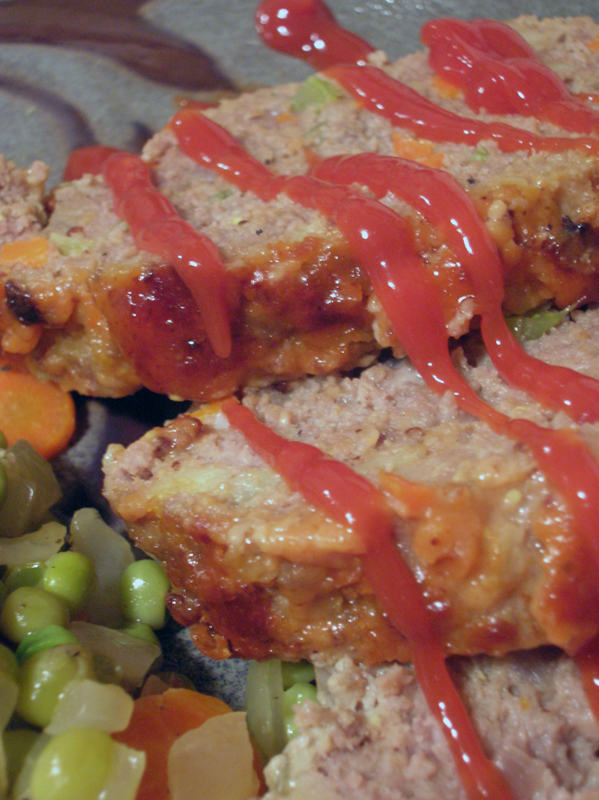 Spread the ketchup mixture over the top and lightly down the sides of the meatloaf to glaze it. Bake until an instant-read thermometer registers 160 degrees F in the center of the meatloaf, 40 to 55 minutes. Let the meatloaf rest for 10 minutes. Transfer to a cutting board or serving platter with a large spatula and cut into 3/4- to 1-inch-thick slices. This entry was posted in Food, Drinks and Cooking and tagged American, classics, dinners, meat, recipes, vegetables. Bookmark the permalink. thanks for these recipes and lovely photos. I was inspired to create both dishes.